Does studying German and interning and Germany really help Science majors in their med school applications and careers? We recently caught up with CofC alum Stuart Gilreath ’14, currently a medical student at the University of South Carolina, to ask about his experience as a minor in German at CofC and intern at a hospital in Germany through our Cultural Vistas Summer Internship program. 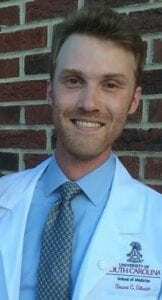 Stuart Gilreath ’14 (Biology and German, Honors College), currently in med school at the University of South Carolina. “During the summer of 2012 I enrolled in the Cultural Vistas Summer Internship program alongside a handful of other students. This program provides a wide variety of internship opportunities. Members of my group were awarded internships in business, publishing, sports management, art management, chemistry, and healthcare. My internship took me to the Chirurgische Klinik und Poliklinik TU, München, where I shadowed surgeons and medical students. Beyond simply shadowing, some of my other tasks included holding retractors during surgery and assisting with wound dressing (under supervision, of course).